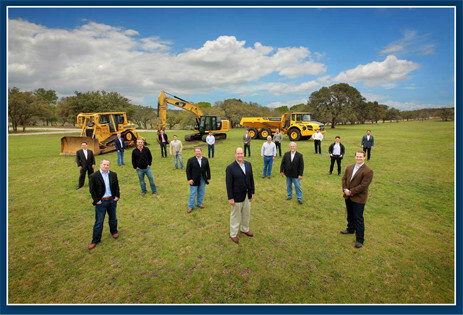 (April 2, 2014—Dripping Springs, TX) Allegiant Realty Partners broke ground March 27th on Caliterra, a master-planned development located off Ranch Road 12, one mile south of Highway 290 in Dripping Springs. The development, with lots for 585 homes, features majestic Hill Country views along a very scenic portion of Onion Creek. Homes in the initial phase will range from the high $200s + by Drees Custom Homes, David Weekley Homes and Highland Homes. Custom Homes prices will start from the $700s. Nearly 250 acres of Caliterra will be preserved as open space to maximize views, protect wildlife habitat and maintain the rural ranch heritage of Dripping Springs. Outdoor recreational amenities include miles of nature trails, a 30-acre Central Park, four bluff overlooks, bird blinds for viewing many species of migratory birds, duck and bird houses, a fishing pier, community orchard and gardens, and the Turkey Hollow Tree House. Community life at Caliterra will center around the local Dripping Springs community and the on-site Barn Hall and Gardens for resident and community gatherings. Caliterra will also feature an Interpretive Education Center, a neighborhood park and Pavilion with covered picnic area, barbeque pit, outdoor fireplace, and resort style pool with splash and lap pool in the community amenity center. The first two sections of Phase I lots in Caliterra will be delivered by September 15th with model homes anticipated to be open in December of 2014. Additional lots will be delivered November 15 and the custom lots will be delivered December 15. Approved custom builders include Sterling Custom Homes, Sommerfeld Custom Builders, Bud Bartley Custom Homes and Randy Rollo Custom Homes. Andy Barrett & Associates, PLLC was instrumental in facilitating the Hays County Development District #1 which was key in making Caliterra happen. CMA is the engineering firm, Jackson McElhaney is the architect and RVi developed the master plan including a comprehensive park and open space plan as well as designing the community amenities and landscape architecture. Plateau Land & Wildlife Management will be responsible for protecting and enhancing the land and wildlife. Funding for Caliterra came from a strategic partnership comprised of investment firms Isles Ranch Partners, LLC and Castlelake L.P. The partnership has also closed two other real estate transactions with Allegiant Realty Partners and is currently evaluating new opportunities throughout the state of Texas. Allegiant Realty Partners is a strategic partnership of two industry leading residential development firms in Texas. Siepiela Interests was formed by its principals James A. Siepiela and Gregory L. Rich in 1987 as a diversified development company concentrating primarily in residential land development as well as light commercial/retail and multi-family development. The Siepiela Companies have been involved as the primary developer on more than 5,000 lots in Dallas/Ft. Worth including 11 of the suburban cities of DFW, Austin and other Texas cities. Taylor-Duncan Interests was formed in 1992 and is owned by Larry R. Taylor, Phillip W. Duncan and Spencer M. Taylor. The company focuses on land development and investments, with a primary emphasis on residential lot development. Taylor-Duncan and its related affiliates have developed thousands of lots in the Texas markets of Dallas-Fort Worth, Austin and San Antonio as well as in Nashville, Tennessee. TDI is currently involved in the development of six new communities located in Dallas/Austin and Nashville and has several more in the planning stage. Isles Ranch Partners, LLP is an alternative investment management group targeting opportunistic, value-driven investments primarily in the residential acquisition, development and construction (AD&C) space. Founded in August 2012, the firm has a team of 12 professionals in Newport Beach and Minneapolis. For more information, please visit www.islesranch.com. Founded in 2005, Castlelake L.P. is a global special situations investment organization with approximately $3.6 billion in assets under management comprised of commitments from endowments and foundations, public and private pension plans and family offices worldwide. The team is comprised of 59 professionals and offices in Minneapolis and London. For more information, please visit www.castlelake.com. Through their strategic partnership, Isles Ranch Partners and Castlelake have completed 24 real estate acquisitions together over the past 19 months throughout the United States. These acquisitions, totaling approximately $275 million of committed capital, were closed with 12 different developer / homebuilder operating partners, including three acquisitions with Allegiant Realty Partners.